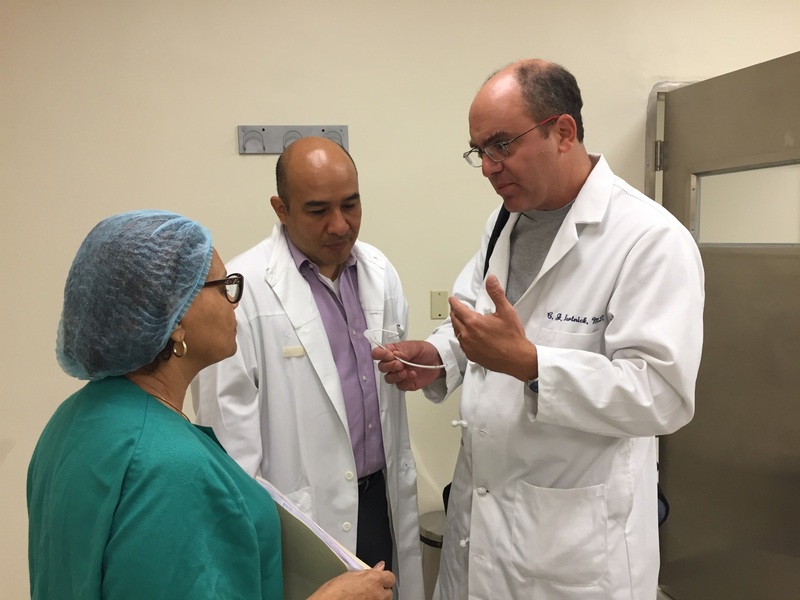 Besides helping the wonderful children, one of the main goals of the mission was to teach the ENTs in the Dominican Republic to do airway surgery. 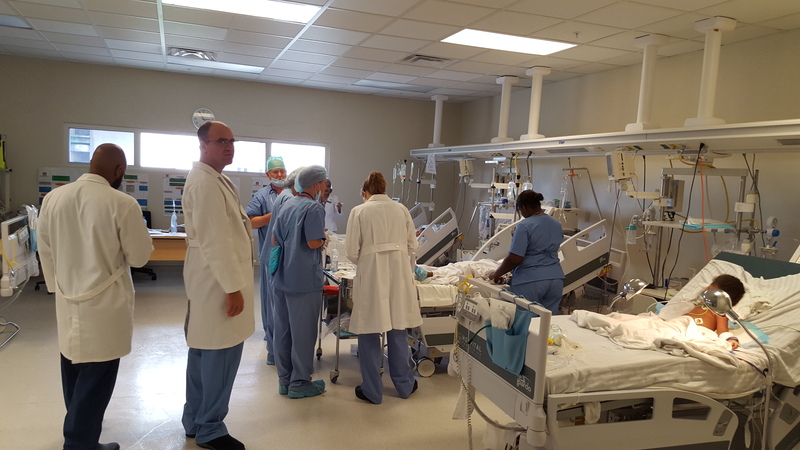 Dr. Mirambeaux and his residents to perform airway surgery. 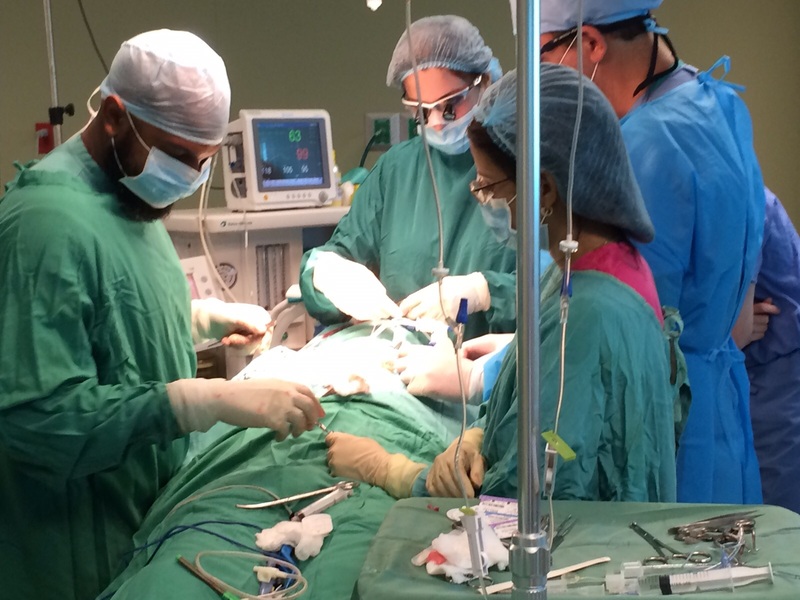 They watched us perform the first case and asked very intelligent and insightful questions. After that, we were able to walk them through the cases. They did a fantastic job performing the procedures and now understand the basic concepts of airway surgery. It is not only important to understand how to do the procedures but also know what procedure to perform in different scenarios. Overall, it was very successful mission. 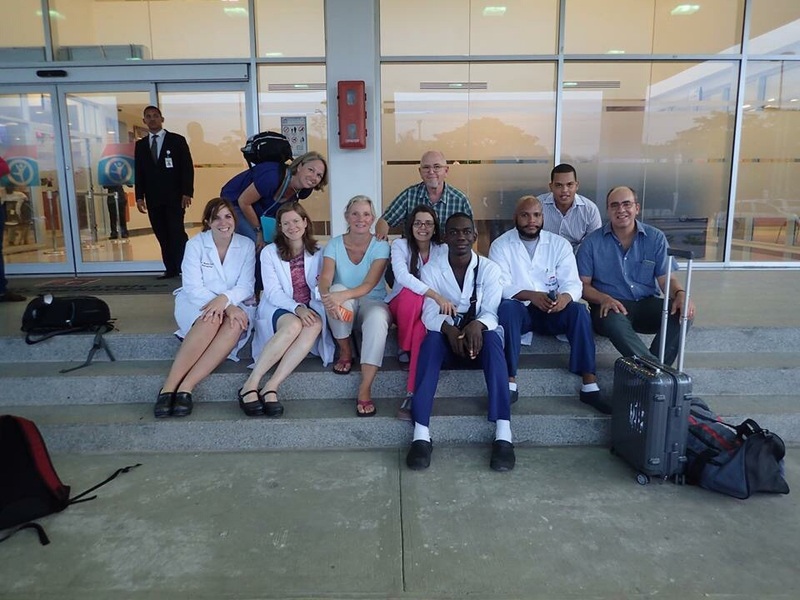 We helped some great kids, made some wonderful friendships, and hopefully planted to seed to inspire further missions and dedication to safe airway surgery. As a rule in the ICU patients did not get out bed so we had to ask specifically for a safe chair. The only one available was one from the MD Call room which they were happy to share. Despite the language barrier, the nurses were open to allowing us to help and were happy to learn suctioning and repositioning techniques necessary for the patients. They were more than willing to learn about the airway patients as they had not ever had airway surgery kids before. Our kids came back with a endo tracheal tube in their nose for airway, and in their necks for stenting open a future tracheostomy which is unusual in any setting. Sarah has a minimal skill for medical Spanish and the plan had been to use wifi for a translation app. The hospital did not have wifi so we were dependent on sign language, smiles and improv …. and the nurses, doctors and families were very patient with our attempts to communicate in variable fashions and somehow communication always happened. 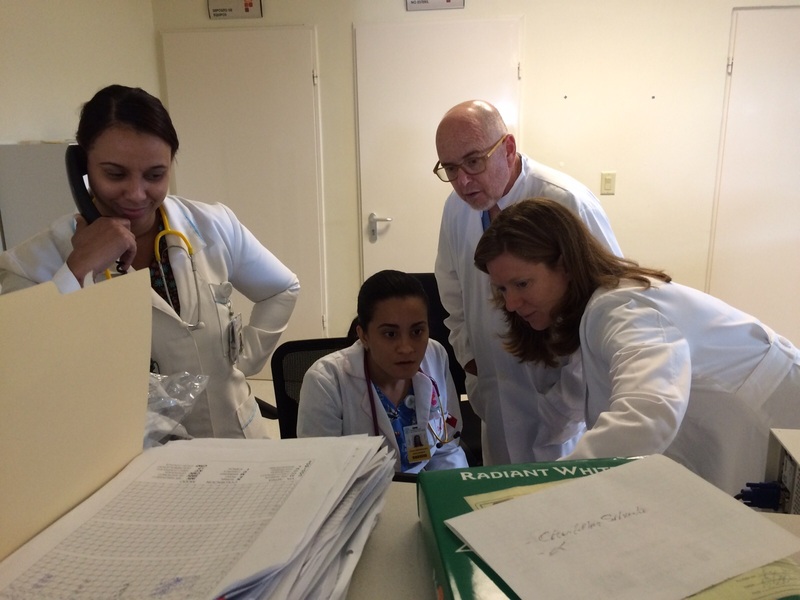 The ICU doctors were also accommodating and excited to learn and hear new ideas and thoughts. 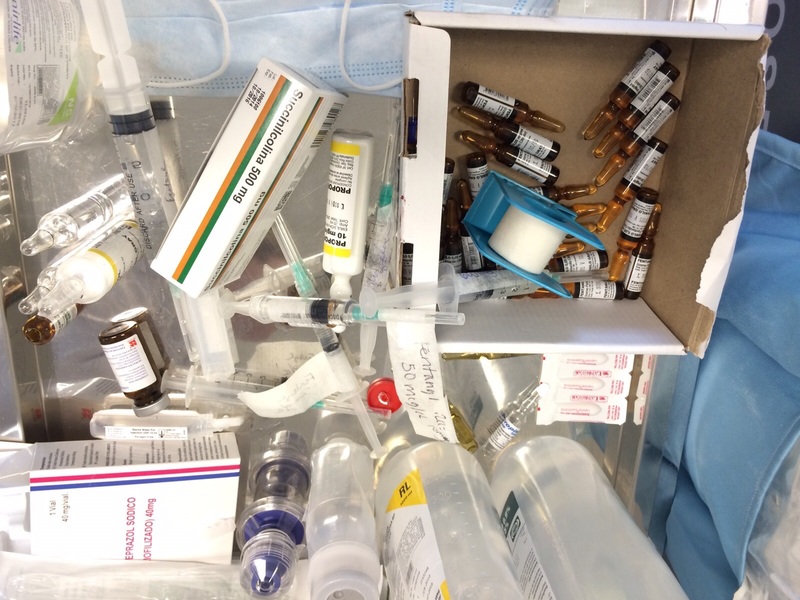 Some of the observations we made initially in the ICU from a nursing perspective was that there was only one sink at the entrance to the unit, and none inside. There were only 2 bottle of cal stat for 6 patients. There were no curtains to divide the patients spaces, (although portable screens were available and used during the death of another patient). There were no chairs for visitors, no continuous tube feeds, no arterial lines for invasive monitoring or precaution gowns or precaution signs for infectious patients. Despite these glaring differences there was an incredible feel of comraderie. The place was spotless, the patients were receiving incredible care and the nurses were warm and welcoming to us both. Day by day Luisa and Cristopher improved and their post of course went well. With this we encouraged the breaking of a few rules and by Saturday as the unit emptied out there was a little music in the PICU, Cristopher got control of the remote control and the visiting policies were relaxed. We were even trusted enough to cover the unit during a quick break for the nurses. 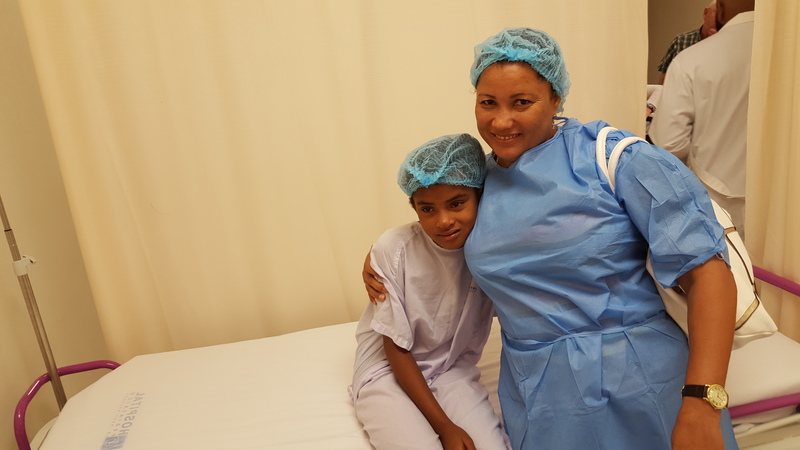 Allejandro was a very endearing 20 year old patient who arrived alone to the clinic with a metal trach and a huge smile and a handshake for everyone and absolutely no voice. 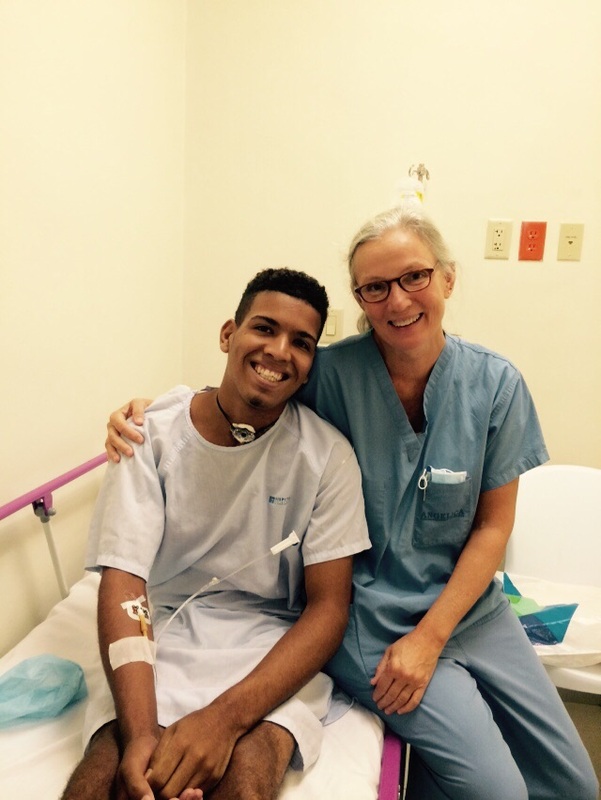 After a bronchoscopy under anesthesia it was determined that his trach was not able to be fixed this trip. He searched us out in the PICU when he woke from anesthesia to make sure we had his number and name for when we returned. We hope to see him in Boston in the future. Christopher, our second patient is a 14 year old boy who had sustained a trauma from falling off a horse 2 years ago. He had a metal trach in place that he kept covered with a bandana from a prolonged intubation and had no voice. 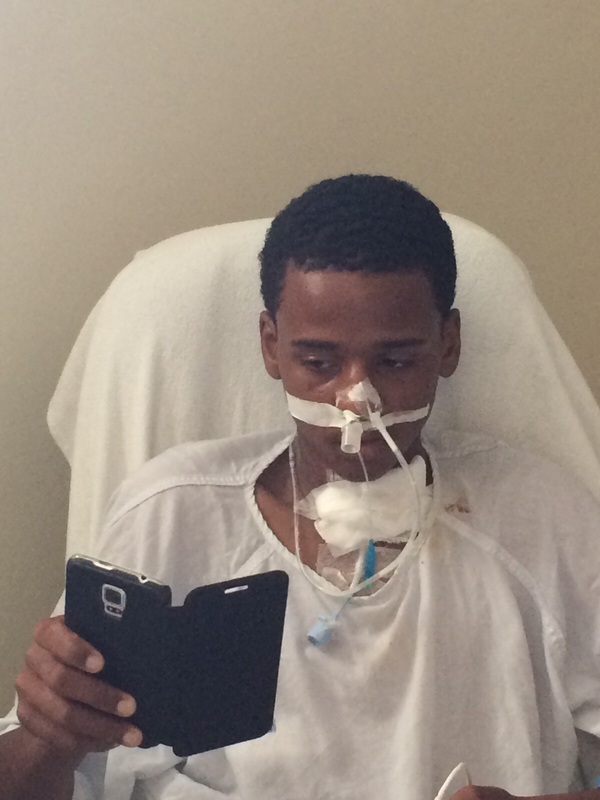 He had had a failed reconstruction in the past and desperately wanted his trach removed and to speak. 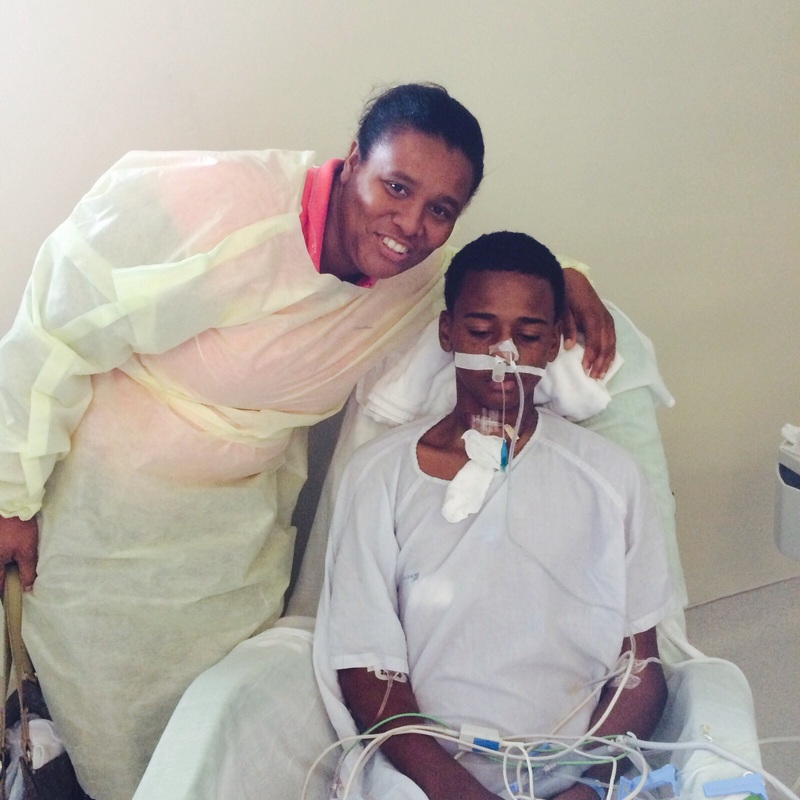 He had not been to school for 2 years because it was felt that it was dangerous to be in school with a trach. He was a quiet but polite boy, tall and lanky and cooperative. He and his Mom were open, loving. Trusting and grateful for the possibility of decannulation and the ability to speak and return to normal life. Christopher also did well in surgery. 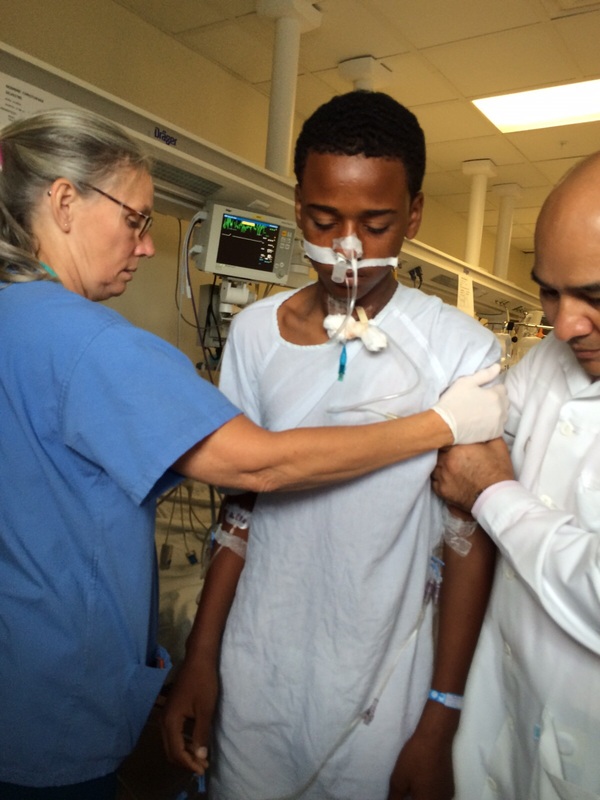 In the immediate post op period Christopher was sad and angry that the trach was still in place. He had not understood that this was a 1.5 stage procedure. He did extremely well in the post op course requiring minimal sedation and pain control despite a nasal ETT and a new temporary trach. He was up out of bed in a day and anxious to use his phone and look at himself in the phone mirror. He was excellent with communicating with us since he had learned to compensate without a voice for the last two years. 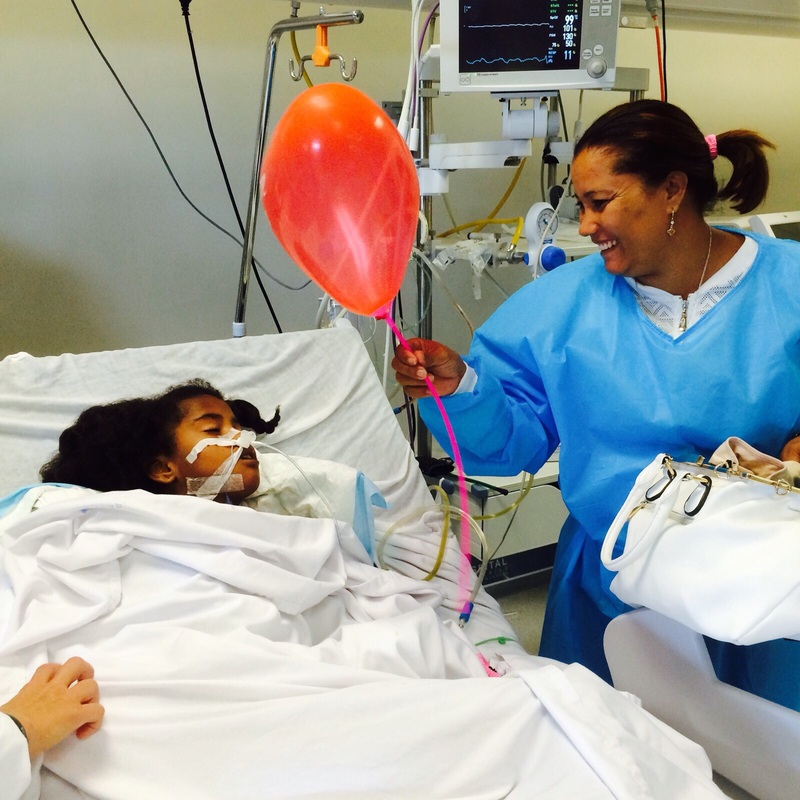 It was so great to see the patients up after surgery and not sedated. Luisa was our first and youngest patient who sat with expressive eyes, huge smiles a friendly face and an extremely hoarse voice. Her Mother was totally grateful for the possibility to hear her voice. She had had a temporary trach in the past after an attempted repair. She sat stoically while our doctors performed a brisk flexible bronch about 2 minutes after meeting her. 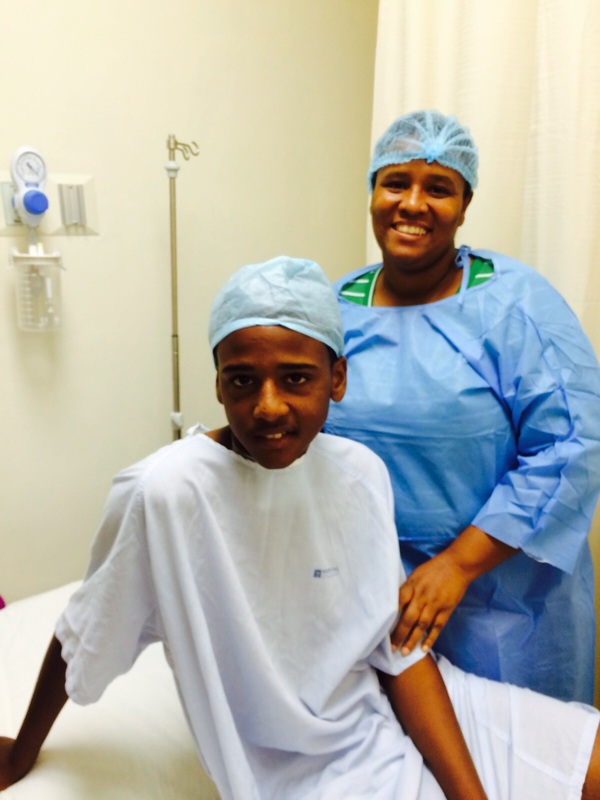 She and her mother instantly trusted our medical staff. The next day in the pre-op area Luisa and Mom were very nervous yet grateful. Mom would not leave the preop area while Luisa was in surgery. The surgery took hours. There is no family waiting room and no food or coffee allowed anywhere in the hospital except the café. The ICU had very strict visiting rules of 20 minutes in the am and afternoon. She sat alone for hours. We tried our best to reassure her. 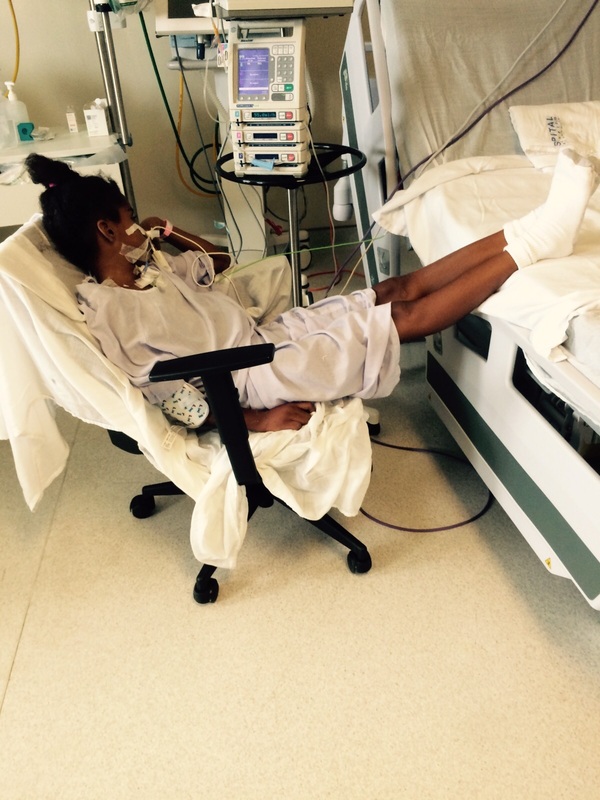 Luisa arrived post op to a busy PICU with only 2 nurses for 5 critically ill patients. We did not observe a formal sign out but the staff was clearly ready for our girl. The intensivists wrote the orders and the nurses picked up and prepared meds. A cardboard box arrived with over 100 glass vials that needed to be broken open and drawn up for use. Because they were very busy they allowed us to draw up the Fentany and Versed drips from tiny glass vials with 2cc/vial, so over 20 vials per infusion. The bed space is set up before hand with the minimal supplies that they had. Their Nurses were tending to a very ill patient and were distracted during Luisa’s arrival and allowed us to assist with her transition to the PICU. To lessen the need for the very limited sedation meds available the plan was made to allow Luisa to be on very light sedation and spontaneous ventilation. In order to prepare for admission. Luisa’s parents were lovely and patient yet anxious to see her. Mom is a nurse, and Dad a tourist policeman in Punta Cana. Her Mom rapidly formed a bond with our other patient’s Mother and one of Luisa’s first questions was “Where is Cristopher?” despite having only met him the day before. Today was our final day of operating in the hospital. The plan was to fix an airway on a young man who had a history of a car accident and head trauma. Again, after having a tube in his airway for 18 days, he developed a lot of scarring. He had some kind of tracheal surgery in the past and now his airway was completely blocked by scar and he was unable to speak. 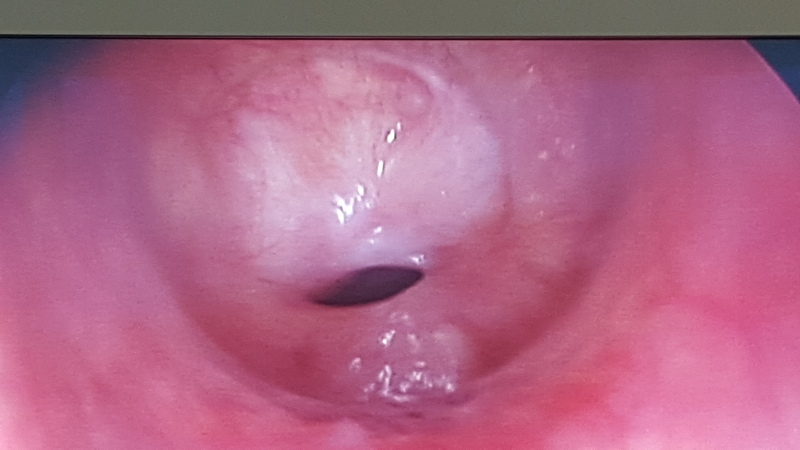 Area below the vocal cords is completely blocked. You can see the suture and unknown foreign object from the prior surgery. 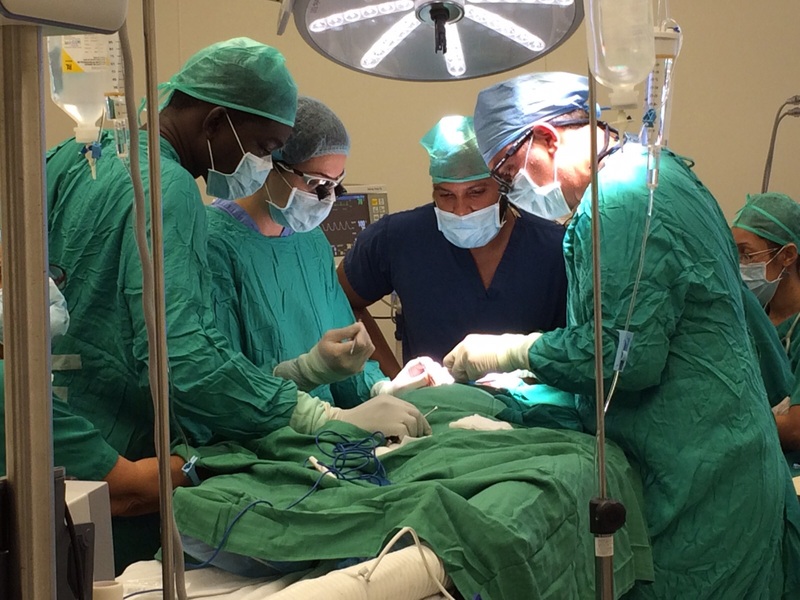 In the operating room, after his airway was opened, we noted that there were too many changes due to the prior surgery (of which we did not know details) that would have made it potentially unsafe to proceed with the surgery. We had to remember to First do no harm, even though we really wanted to help him. We did suggest alternatives for the future, such as removing the scarred larynx (voice box) and allowing him to speak through his esophagus (food passage). This is something the family can decide in the future. He made it safely to the recovery room. Our other three patients are doing WONDERFUL. One is already speaking and is TRILLED. 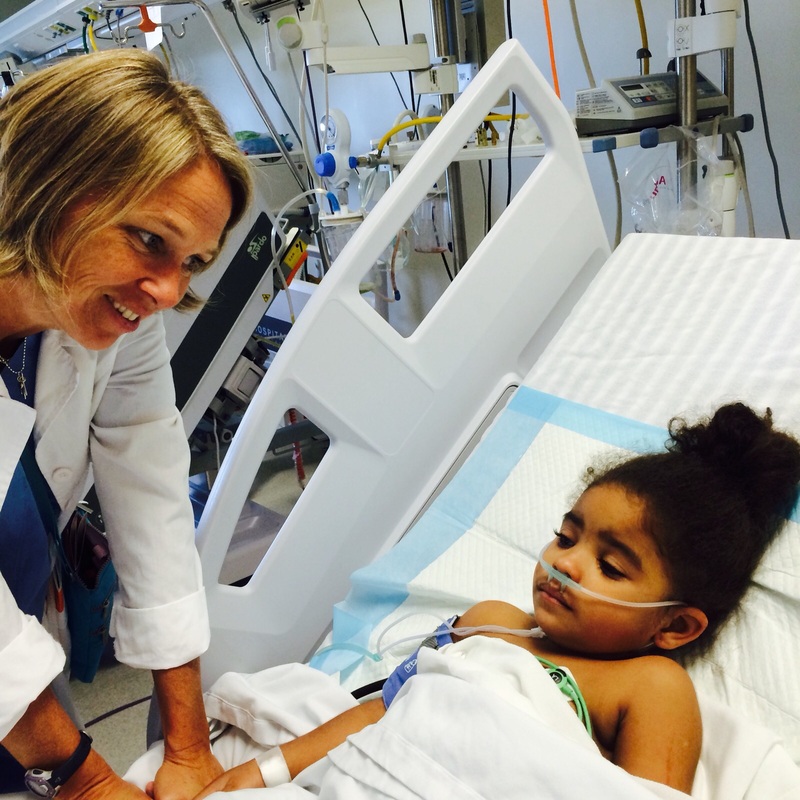 The two patients in the PICU are already moving around and becoming good friends. 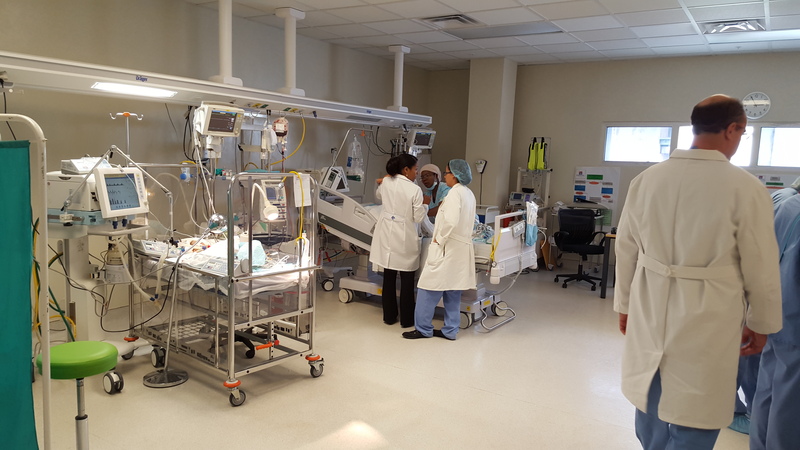 The critical care team has been doing a fantastic job in the ICU. It is very different for them because in the United States, supplies are disposed of after use where here a lot of supplies are reused. There are just such limited resources. Unfortunately, reusing supplies can increase risk of infection. Our team brought a bunch of supplies for the mission and will leave them with every thing that is left over. We started the day by rounding on our two patients from the day before who were doing fantastic. Next, we went to discuss the case ahead for the day which was a young man who sustained head trauma in during a car accident and was subsequently intubated and put on breathing machine for 18 days. 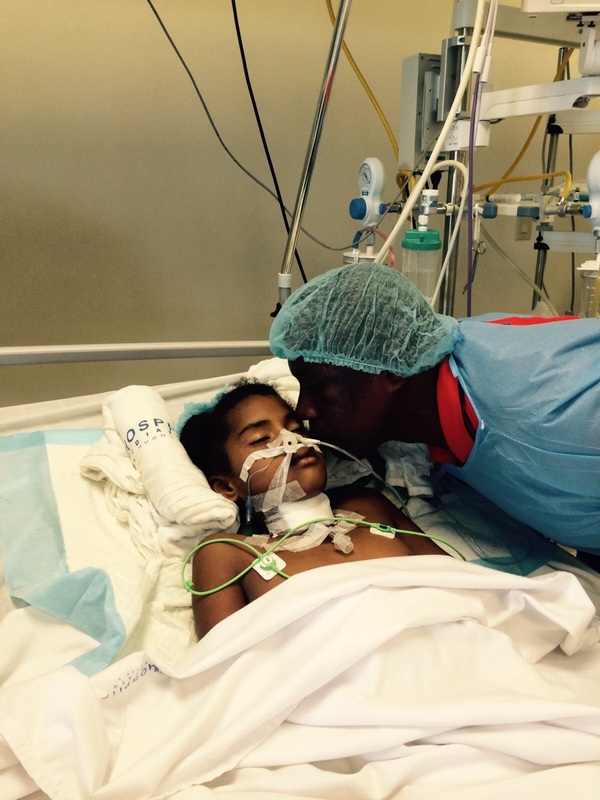 The tube caused a lot of scarring in his trachea and he has had a trach for the past 4 years. 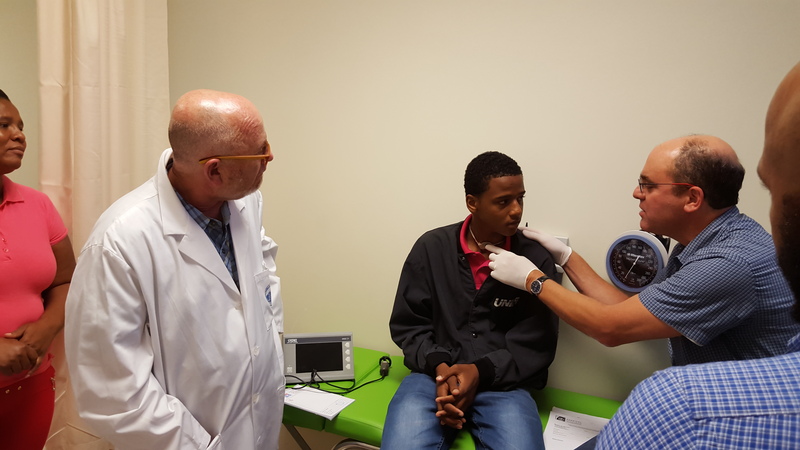 We were able to open up his airway and place a stent (which Dr. Mirambeaux received from another family in the United States) that will allow his airway to heal. The hospital does not supply any needed supplies for the physicians. Dr. Mirambeaux orders his trachs from Ebay when he needs them. They do not have nurses who scrub in and assist in the cases. This is performed by the residents. The critical care team spent the day caring for the patients and learning the culture of the hospital. Everybody at the hospital seemed very receptive to learning about how to care for this type of patients. 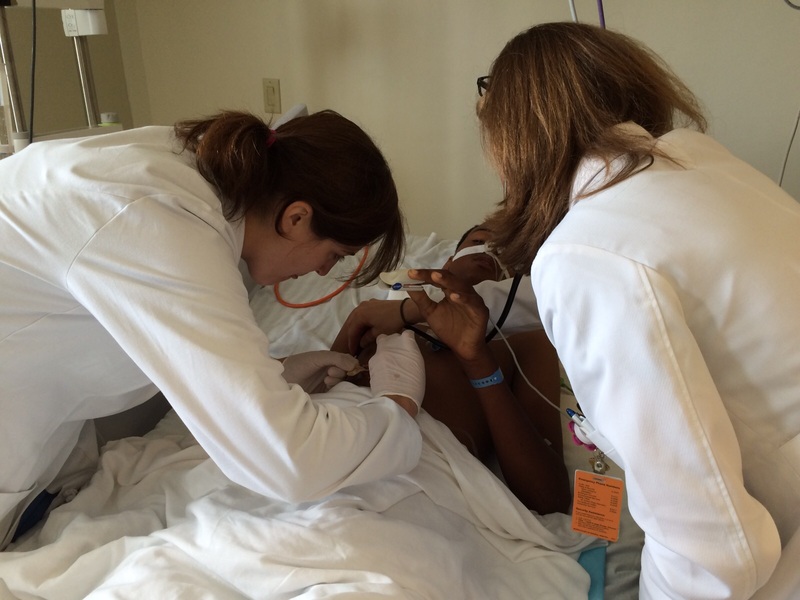 After the surgery, the anesthesiologist stayed with our patient until he was fully recovered. We were welcomed with open arms. 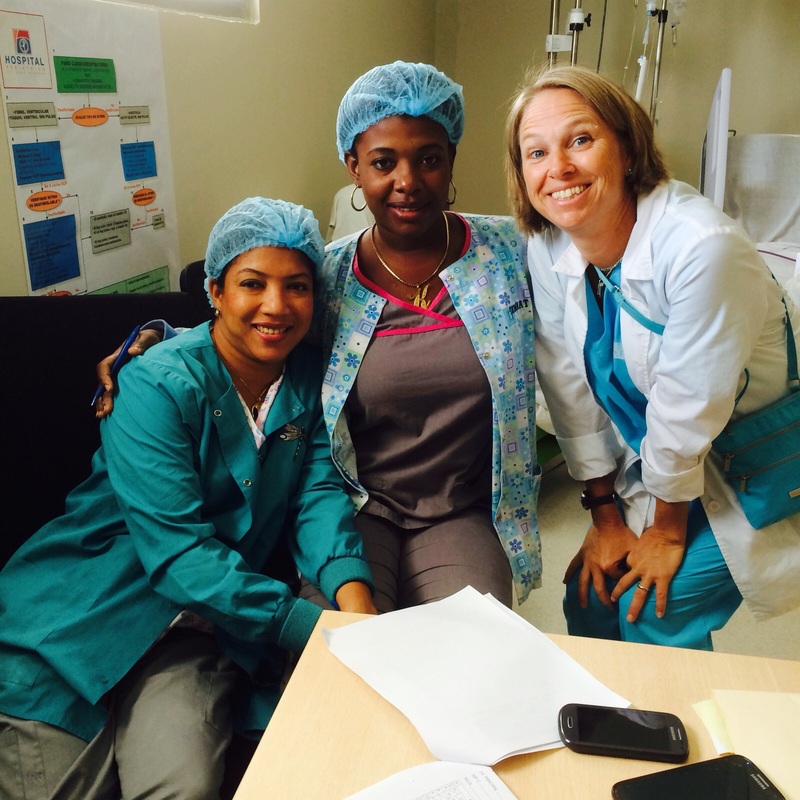 It is amazing the quality of care the hospital team provides despite limited resources. 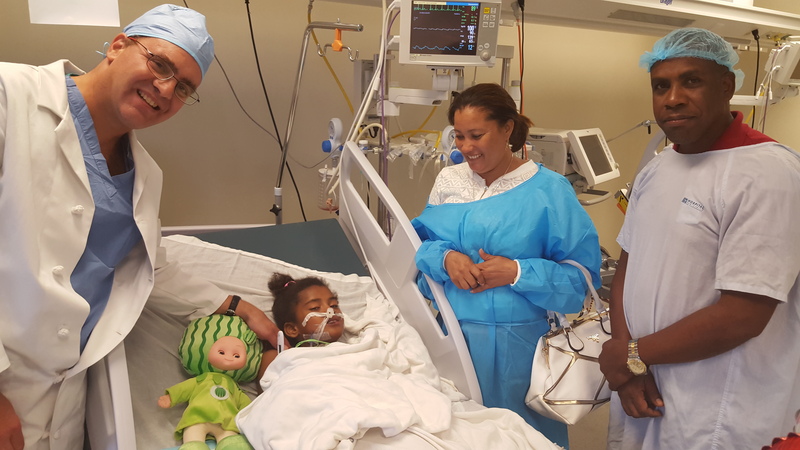 There are so many children in need of airway surgery because the tubes that the Dominican Republic has to put children on breathing machines predispose the airway to a lot of scarring. 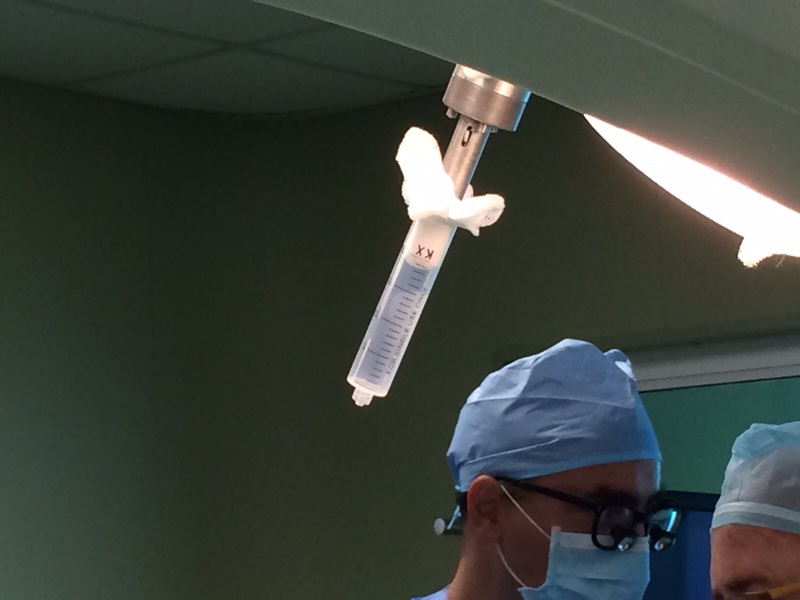 We were able to do three cases (two airway reconstructions and one bronchoscopy). The team in the OR was great. 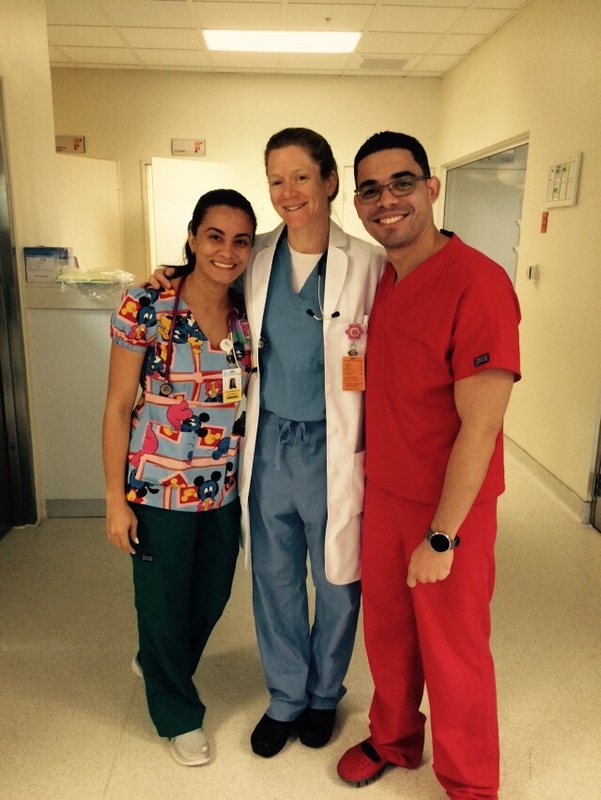 We even had the opportunity to work with two of the ENT residents. They were very excited to learn the new procedures. 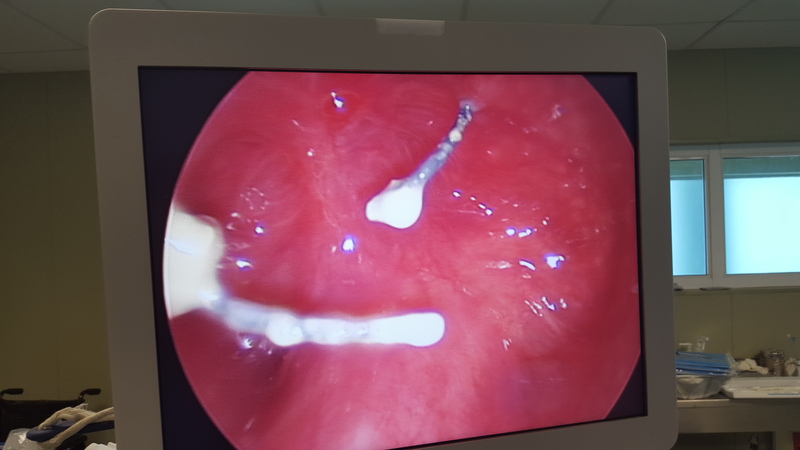 Unfortunately, the young man who had the bronchoscopy performed had to much airway inflammation to do his airway reconstruction at this time. He was already asking when we would be able to come back and help him. 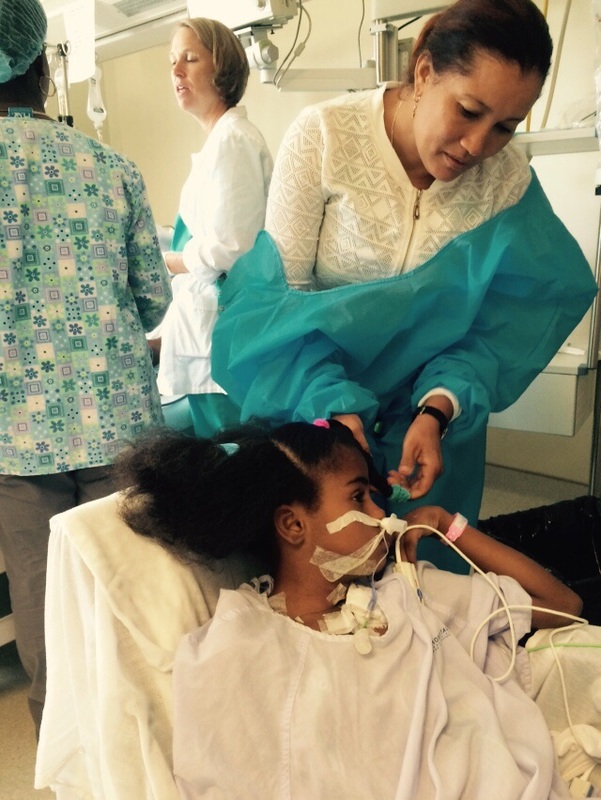 The second airway reconstruction was a 14 year old who had trauma after a horse accident. He was intubated and on a breathing machine for 23 days, developing pneumonia in the process. Due to the long term intubation, he developed a lot of scarring above his trach and was unable to breathe without the trach.